A 53-year-old man has been arrested in connection with the sexual assault of a woman in Orkney. 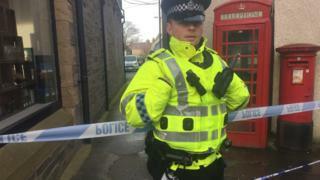 The attack took place in Kirkwall's Burn Lane, near the junction of Albert Street and Bridge Street, late on Sunday night or early Monday morning. The victim was a woman in her 40s and has been left "very shaken", according to Police Scotland. Officers have issued an appeal for any information which could assist their enquiries. Det Insp Donald Macdonald said: "While the victim in this case was physically uninjured, she has obviously been left very shaken and we are providing her with specialist support. "I would urge anyone who was in Kirkwall town centre on Sunday night or the early hours of Monday morning to cast their minds back and let us know if you believe you have seen anything suspicious. "It may well be something which seemed of little consequence at the time but I would ask that you let us make that judgement. It may well be of assistance. "We have been carrying out significant enquiries to establish the full circumstances, including thorough analysis of available CCTV footage."